What is white and can’t connect to the internet? It really is snow joke. 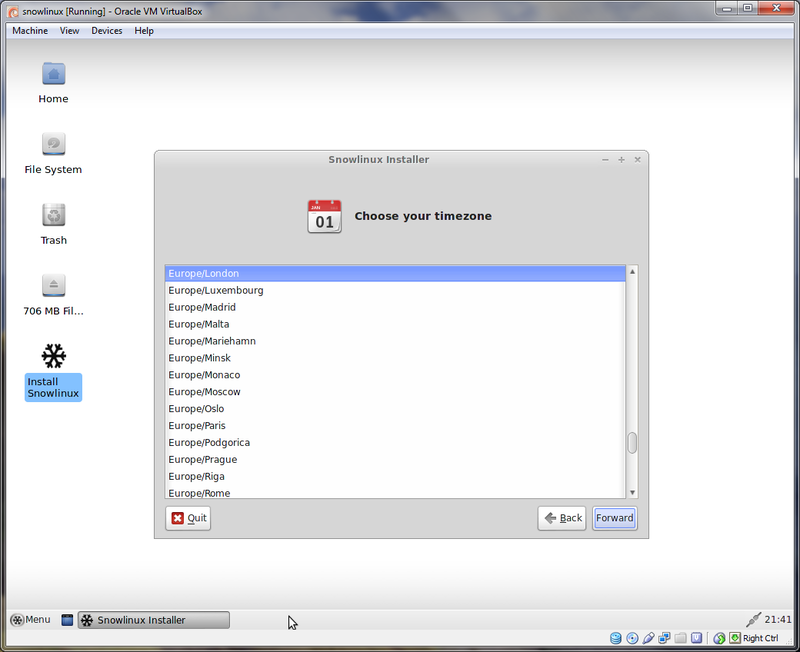 MATE (a GNOME 2 fork) desktop. 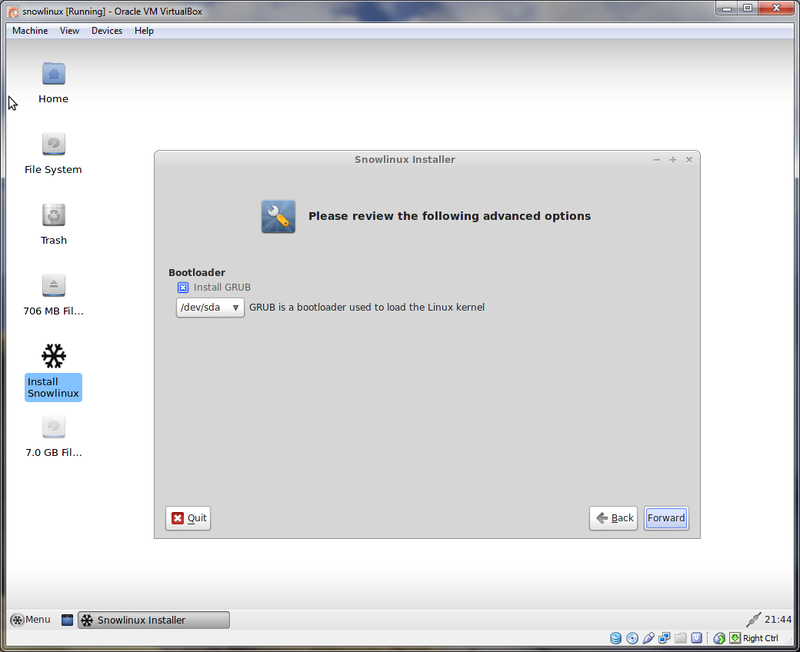 For this review I decided to use the Xfce edition which is based on Debian’s latest stable release. The machine I installed Snowlinux onto is an Acer Aspire One D255 netbook. The first three steps of the installation are fairly straight forward. The next few steps require some knowledge of disk partitioning which might scare away people who haven’t used Linux before. Ubuntu and Mint provide a few easy options for users which will make them feel comfortable such as “Replace your current OS” and “Install alongside your current OS”. Snowlinux does not provide such comfort but this isn’t a criticism because there are many distributions that do not provide such simple options. Really it is a good idea to understand how partitioning disks really works as opposed to allowing distributions like Ubuntu to do it all for you. 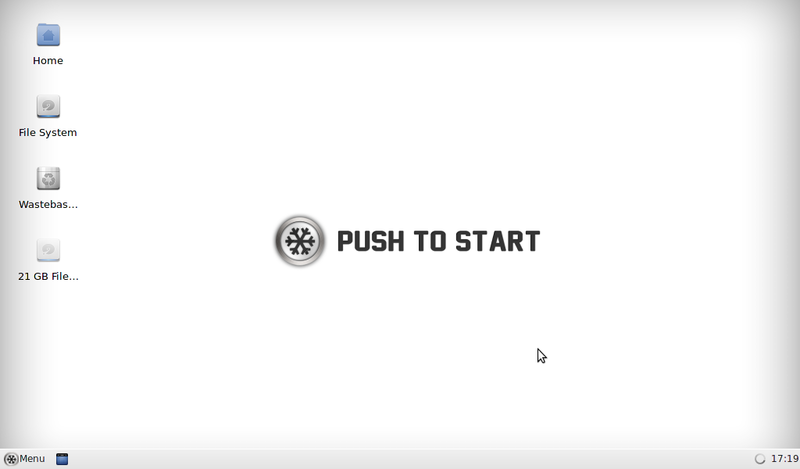 Snowlinux requires you to think about how you want to set up your installation. If the disk is completely blank then a message will appear asking you whether to allow Snowlinux to work out the best way to partition the disks. 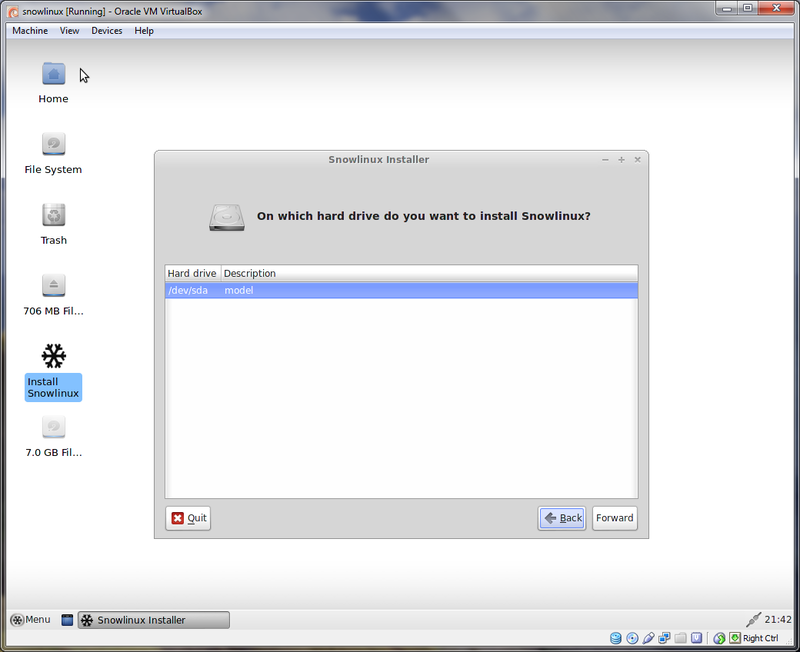 Either way you are shown the available disks and the partitions on the disk and you must then choose how to set up the partitions and on which partition to install Snowlinux. The partitioning of disks is outwith the confines of a review. 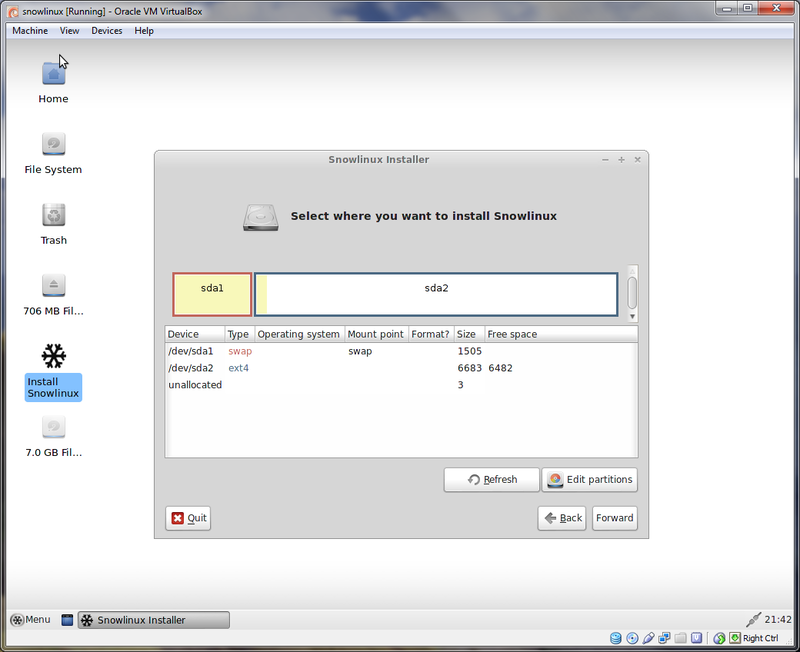 For my partitioning I set up a 20 gb primary partition formatted to ext4 for installing Snowlinux. I then set up a second 20gb primary partition formatted to ext4 for another operating system that I intend to review next week. I set up a home partition for the rest of the disk minus 8gb also formatted to ext4. The 8gb was used for the swap partition. It is imperative that one of the partitions is set to be the root partition so I set the first primary partition to be the root partition (/). The final three steps are more straight forward. Review the choices of the installation script and install. 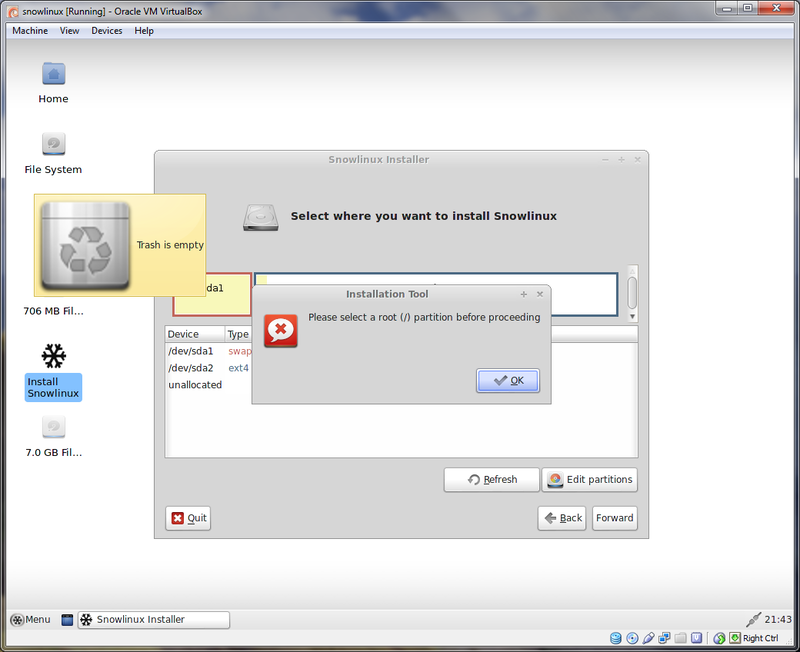 At this point Snowlinux will install and it is possible to reboot into a new version of Snowlinux. Before installing Linux and partitioning disks you should always back up any important files and folders and make sure you have a way to recover if the unexpected should occur. I have used XFCE quite a bit over the past few months so the Snowlinux 4 interface is fairly familiar. The look and feel should be quite familiar to Windows users as well. 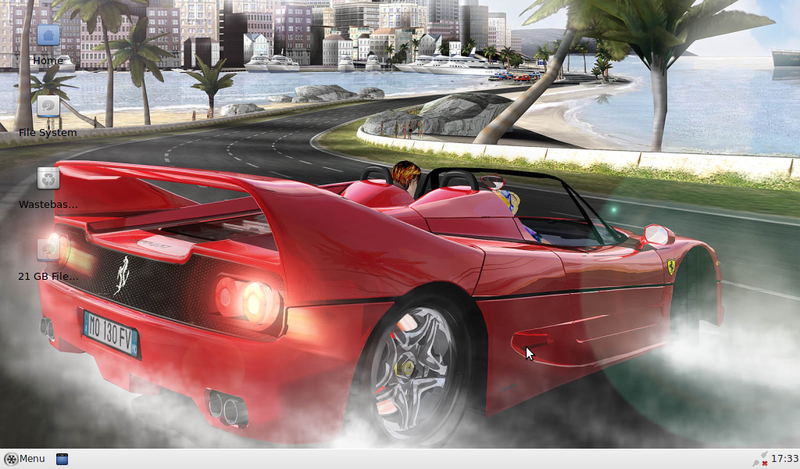 There is a taskbar at the bottom of the screen with a menu button, quick launch bar, a system tray and a clock. On the desktop there icons for the home folder, the wastebasket and all available disks. If you would like to customise the XFCE desktop you can follow this guide which explains how to do so. It was written back in November. 2012 when I started reviewing Xubuntu but should work for all distributions running XFCE. The Snowlinux desktop is a little bit bland but there are a whole host of stock photos available in /usr/share/xfce4/backdrops. 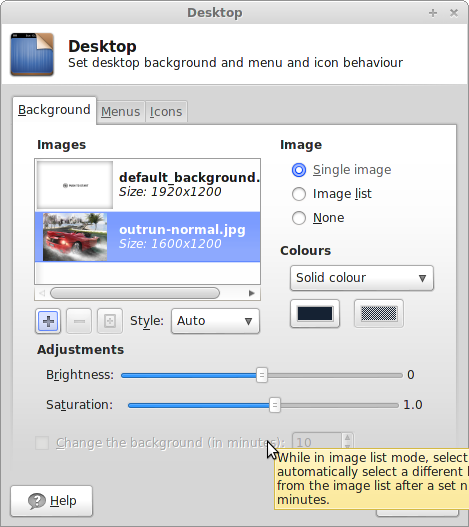 To change the background right click on the desktop and choose “desktop settings”. The desktop settings screen will appear. Click the plus symbol (+) to add a new background image. 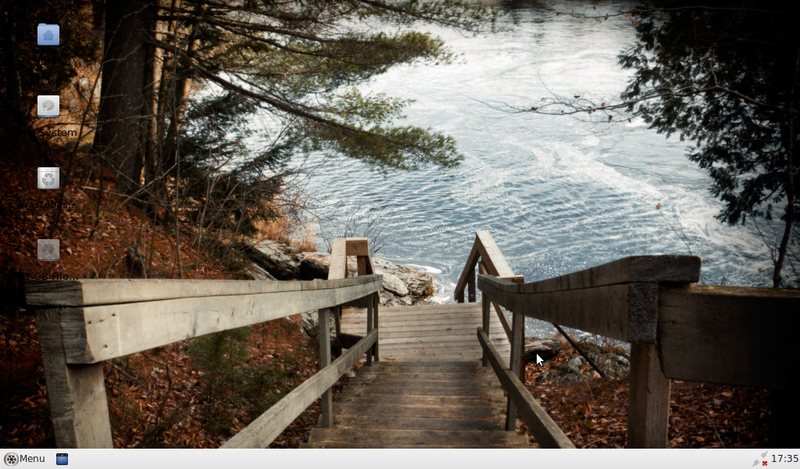 Navigate to the folder where the backdrops are located and choose the image you wish to use as the background. You can of course use an image you downloaded from the internet as well. Now this is where the difficulties began. With every distribution there is always one little thing that causes an issue that you have to find a solution for. More often than not the issue is to do with playing MP3s but very rarely do I ever have a problem connecting to the internet anymore. Imagine my surprise when I clicked the little network icon in the system tray only to find out there were no available wireless networks. My first thought was that because Snowlinux is based on Debian it must be a driver that needs to be downloaded. Now this is of course an issue. If your sole method of getting online is to use a wireless connection then not being able to get on wirelessly makes it very difficult to download drivers. I have a USB wireless dongle that I normally use for my Raspberry PI so I borrowed this for the netbook but this didn’t work either. Luckily I have another computer so I looked online to find out which drivers I might need and there were several suggestions. After a few downloads I was able to get the TPLink USB dongle to connect to the internet but the Intel Centrino Wireless-N 1000 controller inside the Acer Aspire One just would not work. I would like to be able to tell you what I did to fix the problem but I’m not sure which step it was that fixed the issue. If you follow this link then you will get some of the ideas I worked through. First of all I installed an earlier version of the kernel and I set 11n_disable=1 which sped the internet up. However what I can’t explain is that now I’m running the original kernel that was installed with Snowlinux again and the wireless is working. If anyone has an explanation as to what may be wrong with Intel Centrino Wireless-N controllers please feel free to leave a comment below. What occurs to me is that this is a real step backwards. I’m not sure whether this is just an issue for Snowlinux or other distributions as well. Is it a kernel issue? Wireless connectivity works fine with Ubuntu, Mint and all derivatives that I have tried. Do they run a different kernel that just doesn’t have the problem? Is this a problem that is going to come to light again and again in the future? Time will tell I guess on this one. Connectivity issues are like buses, you get no issues for ages and then two come along at once. To get around the “Failed to add/activate connection” error I followed this guide. Flash did not work straight away but it was easy enough to install via the Synaptic package manager although there is another issue to discuss later on regarding Synaptic. After installing the Flash package from the repository I was able to watch videos on Youtube. To test playing MP3s I loaded Rhythmbox. I was expecting to get an error but was pleasantly surprised when the song “Safe Home” by “Anthrax” blasted out into the living room. My wife was less impressed. I can’t speak for every version of Snowlinux but the XFCE version is very light when it comes to the applications that are installed by default. 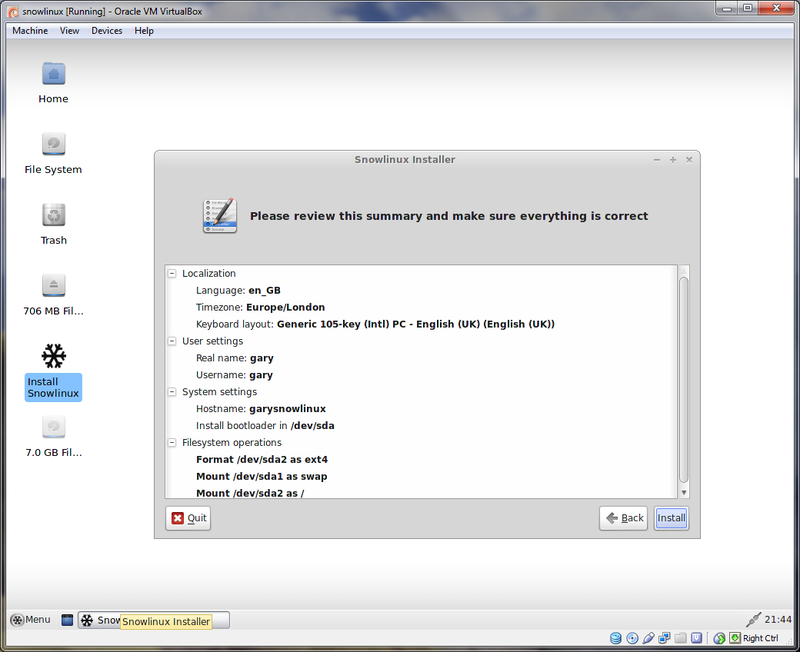 The default package manager in Snowlinux is Synaptic. This is where my next problem occurred. Synaptic won’t load from the menu. The only way I could get it to work was to open a terminal and type “sudo synaptic”. Snowlinux isn’t particularly user friendly. There are just too many hurdles to get around. Installing Snowlinux is possibly too challenging for some would-be newcomers to Linux and the problems connecting to the internet were issues I thought were left in the past. Add to this the problem with the permissions and the inability to run Synaptic from the menu and it could get very frustrating. XFCE is clearly a good choice because as a desktop environment it is very familiar and very easy to customise, however the software choices don’t seem particularly “carefully selected. There is no real office suite (just Abiword) and there are no games. To be honest there is nothing to identify Snowlinux ahead of other distributions. I intend to try the MATE version out to see if I get a better experience. Thank you for the review. I was thinking of trying Snowlinux on a computer I use for trying out distros. While I could probably manage all the workarounds I don't really feel like putting in the time. Especially in regard to the wireless issue. Been there, done that enough times in the past to just want a system that works off the bat with my wireless usb adapter. Thanks again! Try SolusOS. I did "http://www.everydaylinuxuser.com/2013/02/everyday-linux-user-review-of-solusos.html&quot;. Works really well. I have to say though if you have a high specced PC then Linux Mint 14 is amazingly good. Thanks for the recommendation on SolusOS. I'll give your review a look. I've had outstanding results with Puppy on older machines. Multiple versions are currently available, each with somewhat different drivers. I can almost always find one that recognizes all the hardware and works first time, even on ancient P2 machines. Because they're so small (typically 90~120mb each) you can download every Puppy variant in less time than it takes to download just one type of most Linux distros. 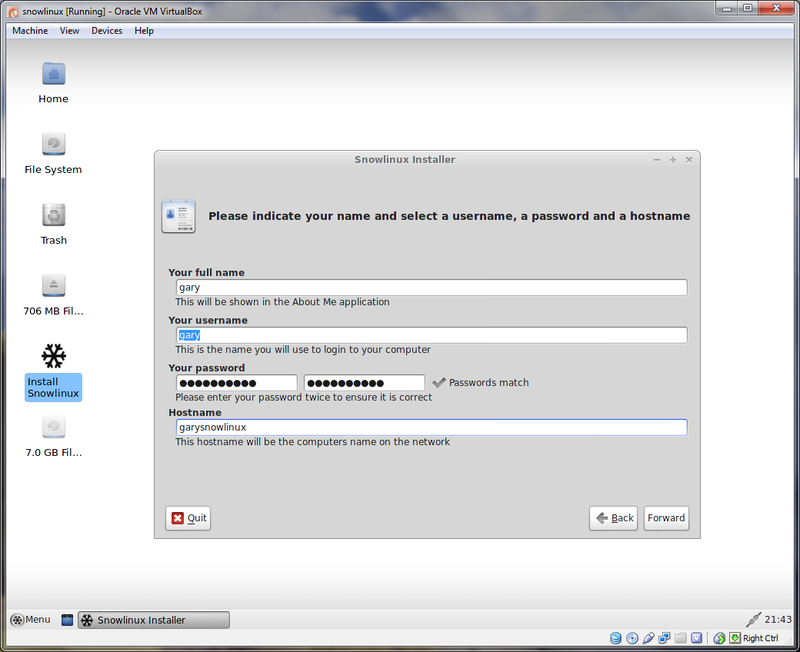 and then trying the Network Manager again, it would work instantly. These problems were like a year ago and I have not run into much here in 2013 so and I have tried many distros too. Also, a very unlikely cause could be that you needed to add your user name to the #/etc/group group "netdev" and then either a logout or reboot and it may have worked. Hope this helps someone in need. I have a space to fill on my hard drive previously occupied by Sabayon and I have been trying out some current distros, so I tried Snowlinux, but the Cinnamon version. It installed without any problems. I happen to like Cinnamon, using Mint 15 with Cinnamon as my everyday OS and I tried Sabayon Xfce for a change but just could not get used to it and could not get wifi with the Lenovo T61, but plugging in a Proxim Orinoco card got round this. I think the problem is with more with Xfce than Snowlinux. I will revisit Snowlinux at some point. I know there are people out there that think it is great.